Water is essential for birds to drink, bathe and preen, but despite deep snowfall and abundant ice, fresh liquid water can be scarce in the winter. Birders who provide heated bird baths give their backyard birds an abundant source of liquid water so the birds do not have to use extra energy melting snow. A heated bird bath will also attract other winter birds that may not be interested in feeders, bringing even more birding interest to a winter yard. These tips can help you keep your winter bird bath attractive and refreshing for all birds that visit. There are two basic style of heated winter bird baths. The easiest to use is a fully integrated bath that has a built-in heater. These baths only need to be plugged in and they will stay liquid even on the coldest days, thanks to the heating element hidden in the basin. If you don't have this type of bath available, however, you can add an immersion heater to a regular bird bath. These separate heaters plug in and the heating element is submerged in the water, where it will keep at least a portion of the water liquid. Immersion heaters are not quite as efficient as fully heated baths, but either type is useful to provide liquid water for backyard birds, and these tips will work for both types of heated bird baths. There are a number of easy tricks that can help you make your heated bird bath attract as many winter birds as possible and give them adequate water even on the coldest winter days. Choose a dark colored bath so it can absorb solar radiation and work with less electricity. A dark basin will also be more visible to birds when the ground is white. Read all the instructions for your heated bird bath or external heating element before use, and follow the instructions carefully. Put out a heated bird bath at the first sign of autumn frost and leave it out until all danger of frost has passed in the spring. When the weather is warm enough the thermostat in the bath will shut off, and when it is cold, it will activate to keep the water liquid. Place the heated bath in a sunny area where solar radiation will help the heater work more efficiently with less electricity. Keep the basin filled appropriately, checking daily for evaporation and splashing that can drain the water. Add stones to the basin or place sticks over the top of the bath so birds will not be tempted to bathe when it is too cold. Most birds will not bathe in below freezing temperatures, but it is easy to ensure they do not. Clean the bird bath regularly so the water is fresh and does not harbor mineral deposits that may prevent the heater from working properly. Soaking the bath or heater in vinegar can help remove deposits, but rinse it clean afterwards. Protect the outdoor electrical outlet with an appropriate cover so moisture cannot enter the outlet and cause a short circuit. Use only outdoor extension cords to connect a heated bird bath or heating element. Adding electrical tape or several layers of plastic wrap over the connection will help prevent moisture from short circuiting the cord. Clear off the edge of the bird bath after heavy snowfall to give birds a place to perch in reach of the water's surface. The snow can be brushed into the water to refill the basin as it melts. A heated bird bath can be easily damaged if is not used appropriately. These easy tips, however, can help you keep a heated bird bath safe for both you and the birds. Do not run a heated bird bath without water – the heating element can malfunction and wear out more quickly if misused. In integrated baths, running the bath while dry can cause the basin to warp or other damage to occur. Do not put external heating elements in concrete bird baths. Concrete will slowly absorb water and as that water freezes and thaws further away from the heating element, it can crack the concrete and make the bird bath useless. Instead, use plastic or fiberglass basins for external heaters. 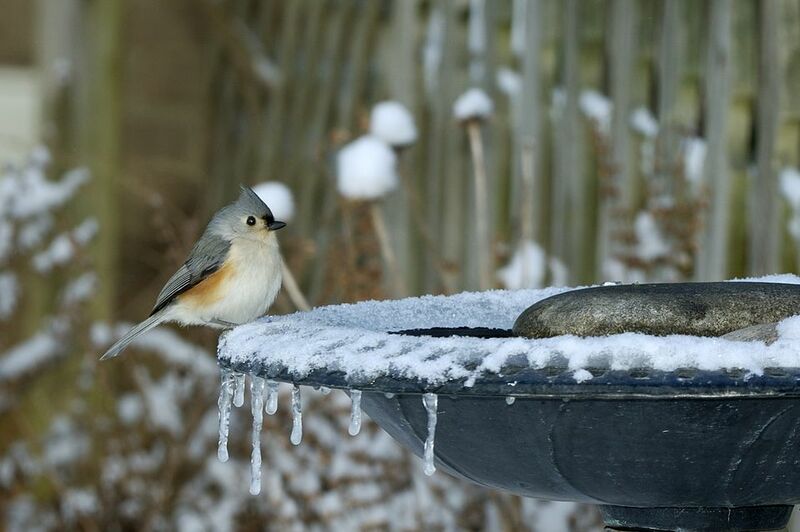 Never add salt, antifreeze or other chemicals to the bird bath to keep the water from freezing. These chemicals can be fatal to the birds, even in small doses, as well as to other wildlife that might visit the bath for a winter drink. Only use properly rated outdoor extension cords to connect a heated bird bath or immersion heater. Check all outlets and connections for proper operation to minimize the risk of any short circuits or other malfunctions. By using a heated bird bath appropriately, it's easy to supply backyard birds with enough liquid water for drinking, bathing and preening all winter long.